The junior and senior ballet companies of Integral Ballet in Merrick performed excerpts from A Midsummer’s Eve on Friday, April 5th to raise funds for Dreas Dream, a project to bring dance and creative movement therapy to children with terminal illnesses and special needs. Integral Ballet school’s in-house student ballet company, held their April 5th FAITH Project performance A Midsummer’s Eve. 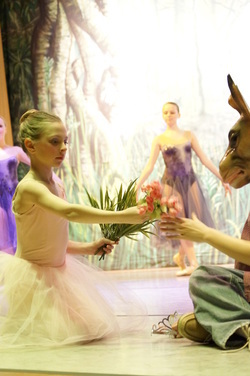 The performance included new choreography to the score of Felix Mendelssohn about the story of Titania, Queen of the Fairies, who is tricked into falling madly in love with a Donkey. This was the company’s eighth local production, giving advanced ballet students the opportunity to both perform and to learn the ins and outs of performance production. The company produces and dances the entire show with help from the Integral Ballet staff. The company recently introduced several new dancers, including a pre-company corps of seven dancers under the age of 7. The FAITH Project was established in 2005 to create a memorial donation fund to the American Lung Association in loving memory of Faith Florida, an alumnus of the Frank Ohman School of Ballet. Students at Integral Ballet may audition for a role in the FAITH Dance Project’s annual performance each year in January. Students also participate in performances throughout the year at local senior homes, street festivals and lecture/demonstrations. Integral Ballet is located at 1842 Merrick Road in Merrick. Call (516) 442-1590 for class, audition and booking information. For more information, visit www.integralballet.com.